Digital technologies are impacting all aspects of business and society, changing our workplace, culture, and way of life significantly. 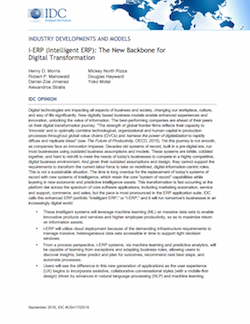 This study provides a framework based on three dimensions for understanding this movement to i- ERP and for assessing the progress of vendors to realize the promise of i-ERP and intelligent systems. Make sure you are prepared for this movement and download and read this article today!